Powderfree lowering the chances of product contamination. Liquid proof Prevents liquids from reaching the users hands. Ideal for general lightweight work including working in the food industry. Beeswift Disposable Nitrile Ndgpfpu Glove conforms to: EN 455 safety standard. Ansell's Touch N Tuff® glove is excellent quality. 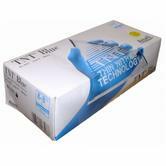 4 millimetres thin nitrile disposable gloves. Provides a whole new standard in durability, comfort , cleanliness, and dexterity. 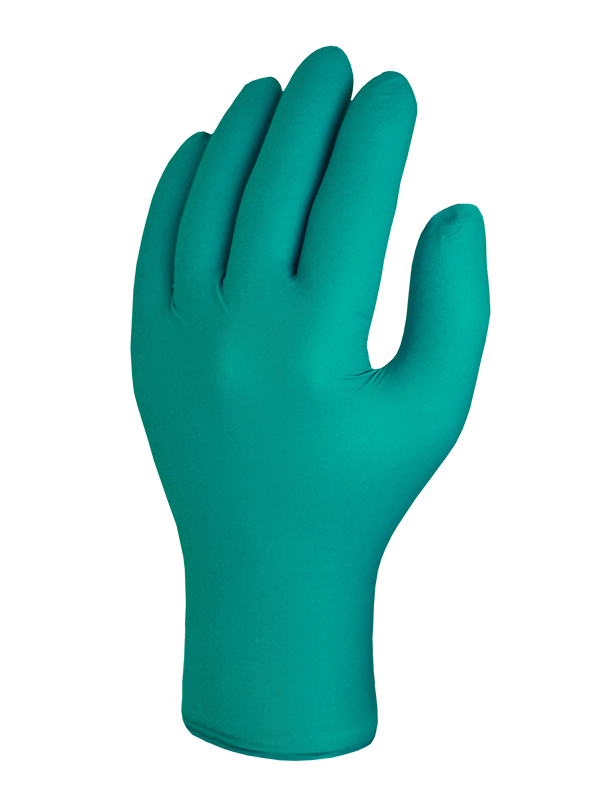 Manufactured with 100% nitrile, the gloves contain no fillers, plasticisers , or silicones. Maintain puncture resistance superior to competitive latex or vinyl gloves. Suitable for Handling hazardous materials, Cleaning up potentially harmful substances and much more. Double donning is the safest practice when handling very dangerous materials. Inspected according medical requirements to an AQL of 1.5 for pinholes, which matches the legal requirements for medical gloves. Ansell Touchntuff 92-500 Nitrile Coated Powdered Disposable Gloves conform to: EN 374 Cat. III standards. Disclaimer: please note the images shown are for illustration purposes only; the colours or design may be subject to changes by the manufacturer. Thinner, lighter and more flexible than standard Nitrile, our new Amazing® gloves are so comfortable, you’ll feel the day just fly by. Developed with natural rubber latex but made significantly stronger by the addition of nitrile. They also conform perfectly to your hands to give you the superpowers you need to conquer the day. The unique Nitrile formulation of Amazing® is thin and flexible enough to deliver higher-tactile sensitivity, yet strong and safe enough to perform under pressure. Provides a stable and comfortable experience and Superior resistance to oil & chemical penetration. Specially treated to reduce the chances of allergic reactions and product contamination. Designed to provide superior sensitivity to the user during high percision tasks. Ideal for applications with low risks, perfect for genral handling tasks. Conforms to EN374 Safety Standards. Aurelia Bold Nitrile (Non Latex) Powder Free Examination Gloves. Aurelia Bold gloves are made from 100% Nitrile, there is no Latex. Ambidextrous, black color and non-sterile gloves for single use only. Automated packing to enhance single powder-free glove dispensing. Quality Signs & Certificates: ISO 9001:2008, ISO 13485, CMDCAS 13485 (SGS), EN 455 1-4, EN 420 : 2003 + A 1 : 2009, EN 374 2-3, EN 388, EN 1186: Food Contact Approved. Manufactured from latex providing a smooth surfaced glove along with a smooth experience. Microtextured glove offering exceptional grip these examination gloves are 100% rubber. Design to be Ambidextrous making it a fast and easy setup process. Tactile sensitivity is achieved through the cleverly selected materials used. Tested to the highest international standards. Gloves manufacturer and package can vary. Completly powder & latex free lowering the chnaves of any issues with allergies. The fingers are textured providing the user with additional grip. The N-DEX Original 7005 disposable gloves provide dexterity and a significant reduction in hand fatigue. Cuff prevents dirt from entering the glove. These N-DEX gloves provide superior comfort and barrier protection against a variety of chemicals, greases, oils and blood borne pathogens. Provides great freedom of movement for the wrist. Showa 7005 N-DEX Original Nitrile Disposable Glove conforms to: EN420 Cat.3 EN374–2 EN374-3 safety standards. Supplied in box of 100 units. Aurelia Blush Gloves are powder free examination gloves that provide a finger-textured finish for improved puncture resistance and gripping action, and are made from 100% nitrile (non-latex). 100% Latex Free reducing chances of allergic reactions. Nitrile provides better elasticity than vinyl, better puncture resistance than latex or vinyl, and better abrasion resistance than chloroprene. With a 2.8 millimetre thickness for superior sensitivity. Designed with advanced anti-ageing and moisturising features. Manufactured with a beaded cuff for ease of donning. Aurelia Blush 7888 X 200 Supermax Glove Disposable conforms to EN455, EN420, EN388, EN374 & EN1186 standards. Manufactured with nitrile for improved durability and grip. Highly resistant to Abrasion, animal fats and solvents. The embossed pattern on the palm of the hand improves the users grip. A high level of resistance to abrasion, solvents and animal fats - ideal for working in the food industry. 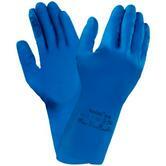 Beeswift NG Nitrile Flock Lined Glove conforms to: EN388 4.0.0.1. EN374 CAT 3 J K L safety standards. Seamless nylon liner with a HPT foam coated palm. Exceptional grip in both wet and dry conditions. Durable glove with excellent flexibility and sensitive touch. Secure design provides a comfortable fit. Breathable back of hand area, reduces odour. Grades(Abrasion: 4, Cut: 1, Tear: 3, Puncture: 1). Skytec Ohio Black Safety Glove Conforms to EN388. These clear gloves are powdered with corn starch to lubricate the gloves. Disposable gloves, Scissors not included. Aurelia Delight offers an exceptional quality and manufactured to an extremely high standard. 100% latex free gloves are non-sterile and have a beaded cuff for ease for using. Aurelia Delight Clear Powder Free gloves are food contact approved and are class 1 medical grade. Powder-free gloves reduce the absorption of environmental allergens, most household chemicals, and are suitable for the majority of everyday tasks. Aurelia Delight Vinyl Powder Free Gloves Conforms to: EN388, EN374-2, EN374-3, EN1186, EN455. 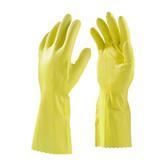 These Vibrant Latex Gloves are nonsterile powder-free. The exclusive and advanced rinsing process improves quality and purity. Ambidextrous produced from 100% rubber with a micro-textured surface. Aurelia Powderfree Gloves conform to: EN455 CE Class 1 Medical Grade, EN420, EN388 & EN374, EN 1186 Food Contact Approved. Soft formulation for improved sensitivity and user comfort. 100 Gloves per box. Conforms to EN455, EN420, EN388, EN374 & EN1186. Conforms to EN374 Safety Standard. Heavy duty high visibility orange gloves that are 50 times stronger than ordinary disposable nitrile gloves so they won’t tear so easily. The diamond textured finish gives extra grip; these gloves are ideal for professionals, hobby mechanics or even DIY enthusiasts. Swift Household is a lightweight rubber glove with a cotton flock lining. This natural rubber glove is highly flexible and dexterous. It is tapered at the wrist and anatomically shaped for a more comfortable fit. Handling ability is enhanced by the slip resistant pattern on the fingers and palm, increasing the level of grip in both wet and dry conditions. Its anatomical shape and flexibility minimise hand and wrist fatigue, and the soft lining absorbs perspiration keeping the hands cooler and more comfortable for longer. SHOWA N-DEX Ultimate 9905PF Disposable Chemical & Biological Hazard Glove - Medical exam glove. Protects the hand from a wide array of chemical hazards with lower allergy risks. Easy to put on and remove, comfortable cuff prevents dirt from entering the glove. SHOWA N-DEX 9905PF - Second skin feel glove, easy to tear away in case of emergency break, it can easily be one-hand used. 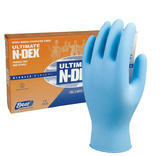 Showa N-DEX Ultimate 9905PF Nitrile Disposable Gloves conforms to: EN 420:2003+A1:2009 Cat.III EN374-1: 2003 EN374-2: 2003. We sell disposable gloves including the basic household gloves (or Marigold gloves) such as the Ansell Econohand gloves or the Jodal Swift household glove. We stock the leading brands, such as Ansell, Aurelia, Polyco, Portwest and Showa. These are available from our stock for same day despatch!. We offer Nitrile gloves – these are super thin and fit like a 2nd skin, yet the nitrile gloves are 3 x times more puncture resistant than latex or PE gloves! We sell Polyethylene (PE) disposable gloves (powder free)– which are typically used for handing food (eg at deli counters etc). PE gloves are transparent, basic, loose fit and without any great grip or stretchability. Our latex rubber gloves are also available powder free, such as the Aurelia Powder Free Latex gloves. All the standard disposable gloves that we supply have an AQL quality of 1.5. Where appropriate, they are all made with Non-genetically modified Corn starch powder.